A very unique place in Mendoza. The villa (with its own bathroom and toilet) sleeps 5 and an additional couple in a detached studio flat, separated from the main cabin by around 150feet (fully equipped and furnished with its own bathroom and toilet) in a queen size bed. Private pool with its own barbecue and restroom. Artificial lake . A huge palm tree on a small hill. A separate extensive barbecue section. Land has a security gate and is fenced on all sides, for security purposes, with a 24/7 electronic security system in place. A football/soccer field and a ping pong table available. WiFi internet.. It is important to point out that the whole property is rented to just one group at a time.This assures full enjoyment of all the wonderful the facilities in total privacy. The Fauna at Quinta Anabtawi is very varied and very enjoyable! Quinta Anabtawi is not a B&B, it's your private resort. There is no staff to attend to you. Yours truly, Riyad (Owner/Manager), does not live on the premises either, although I'm only 10 minutes and a phone call away . I will receive you with an open heart and make sure that your first day goes without a hitch. Then I leave you to enjoy the Quinta in complete privacy. I can very easily be contacted by e-mail or by cell phone. There is no gardener either while you are there. Gardening is performed while you are away visiting the many close by wineries and sightseeing. I strive very hard to ensure your stay is as comfortable and private as possible. During your stay, I highly recommend booking a Riyad Argentinian BBQ Extravaganza : The best Argentine meat -- grilled the right way-- the Argentine way, hosted by yours truly. I propose this because you will never get the same experience in a restaurant. Most restaurants pre-cook the meat, and only heat it up for serving. With a Riyad Extravaganza BBQ, you will experience a typical home made Argentinian BBQ. After all, if you've been in Argentina and haven't had a typical Argentinian BBQ, you haven't been in Argentina. Hello! 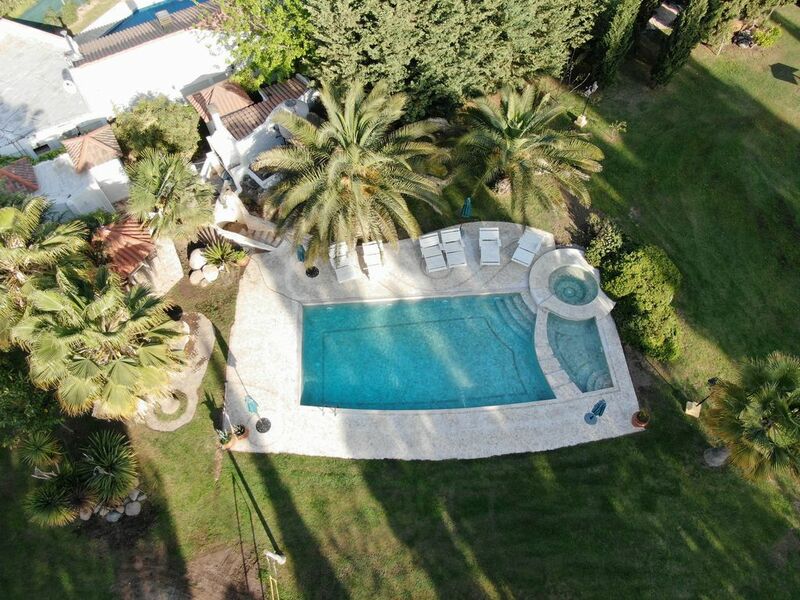 My name is Riyad and I will be your host at the Quinta Anabtawi, my second home in Mendoza, Argentina. I will make sure to make the Quinta your second home here. I do hope you can come one day and spend some time with us. One thing I can promise: a warm welcome, and a lasting friendship.. I speak fluent English, Spanish and Portuguese, with a working knowledge of Italian and French. Having recently retired, my husband and I were looking forward to a quiet and relaxing three weeks in Argentina. La Quinta didn't disappoint. It was very comfortable and, even though it was winter in Lujan de Cuyo, very beautiful. I would recommend that you give this beautiful place a second look. Many thanks to Riyhad for an amazing respite. Wonderful place to relax near Mendoza! It was a great pleasure to host such wonderful, fun people like you. I thoroughly enjoyed having you as my guests! When Mark asked if there was whiskey at the end of the Bbq, I wished I had some. And then to my wonderful surprise there was a Skyy vodka waiting for me the day you checked out. Thank you so much!! Hope to see you again soon. Next time come in Summer, so you can enjoy my pool and I promise a special Bbq. A whole rib of cow cooked on flames, 4-5 hrs cook time with my grill master, Raul! He is an expert at this! Our group was five retired adults, and we anticipated calling taxi’s to take us to dinners. However, on the evening of our arrival we could not get a taxi - actually two taxis needed for all of us. Our host Riyad saved us from a catastrophic night of eating eggs and toast for dinner by driving over himself to take several of us to a place to pick up pizza to go. While we greatly appreciated his efforts - he probably spent 90 minutes coming to get us, waiting for the pizza and driving us back - pizza to go was not what we had hoped for on our first night in Mendoza. We had wonderful all day wine tours the following two days, including large lunches at the wineries, but again we were stuck eating out of the refrigerator in the evenings after having our guide the first day stop at the grocery with us to pick up items for dinner. Riyad had picked up groceries at our request before we arrived, but we had only ordered breakfast food because we had expected to go to restaurants each evening. Bottom line is you really need a car or an arrangement for someone to drive you at night. Aside from the transportation problems, on the positive side the grounds are lovely and we really enjoyed lounging by the pool after a day of wine tasting. On the negative side were problems with the Internet - not completely unexpected in a rural area, but still a problem. There was a consistent but slow connection in the main house, but no connection in the smaller apartment. Riyad is aware and will try to have it fixed, but like all of us is at the mercy of an Internet provider. Also need to be aware that the place is essentially rural in nature, and while clean the facilities are somewhat rustic. Three of us enjoyed this aspect of the location, two did not. The pictures are accurate and descriptive, so nobody should be surprised buy what they find. Despite our transportation problems we really enjoyed our time in Mendoza and would consider returning to Riyad’s place if we had a car. Today, I found the culprit of not having internet at the studio apartment. As for a slow internet, this is what we get, its aerial. For now. Great property and host. Very nice area in wine region (nearby Chacras), easy access to leisure activities destinations (rafting, hiking, others). On weekends, there might be party in the neighbourhood. Overall very recommendable. The inside of the house is dirty and not as pictured. We arrived after staying in a VRBO in Buenos Aires, Beautiful place.This would have been the 4th VRBO for us this year. We have stayed in many VRBO over the years all over the world and each one rated 4.6 to 5 Star, have been as stated. The pictures are not accurate depictions of this house. Pull sheets back and dirt in bed. This house has 4.9 but it is no more than a 1 star. We left after one hour. That hour was to find another hotel. We paid for 4 nights and Breakfast and BBQ. He said all food was bought so no refund period but we weren’t going to ruin a great vacation staying in a small dark dirty house. If you fall for the 5 star rating don’t buy his meal plan. Save yourself a lot of money and stay in one of the many other beautiful places in Mendoza Province. Mendoza is fantastic! It was obvious from the get go that you were hell bent on NOT staying one minute as soon as you arrived, it was in your looks. You did not even take a breather. That, on the contrary to most of my previous guests was never the case. In fact all of my guests gave us the 4.6-5 star ratings. Your rating is false beyond reason. For one, I took personal effort to have the place tip toe clean. Also the breakfast was all prepared with all the glory worthy of kings, spotlessly clean brand new cutlery and plates and all the fanfare that comes along with it. And the BBQ meats and salads and fruits were all specially selected so as not to have place for error. And one hour into your stay you were gone, with only those words: Not to our expectations! This could mean a myriad of meanings. Examples are you did not like the surroundings, you expected more of a city setting, close to shopping and supermarkets. ( In fact you did not rent a car, when most of my guests come with a car rental.) But definitely NOT DIRTY. I will work on the darkness issue by installing brighter bulbs! There were 4 of us, two couples that stayed at Quinta. We had looked forward to this tume to relaxduring our 17 day stay in Argentina and had 4 days booked. It completely surpassed any expectations we may have had! Riyad is the perfect host and every thing he set up for us from dinners, a wine tour with a 5 course gourmet lunch, drivers.were nothing but the very best! The cherry on top was the authentic Argentine BBQ he and his grill chef, Juan, created for us was spectacular! An experience we will never forget. Every bite of food was absolutely delicious and created right before us. The main house and the apartment were very clean and comfortable. The grounds are impeccably kept, and we wandered about in the relaxing atmosphere enjoying the many plants and trees. We can't wait to go back! We found a treasure in Mendoza and a friend in Riyad! Dear Rene. Thank you so much for staying at my Quinta! It was a real pleasure to have your stay as comfortable and enjoyable as possible. Rates based on one couple occupancy. each additional guest is 35US$ per night. Ask for monthly rentals.